If you thought big, stonking petrol motors were about to become extinct – think again! So, what does this eclectic bunch of cars have in common? Well, in a word, POWER. In fact, this foursome collectively puts out 2,000 horses. But they won’t exactly spare the bank balance though. All told, they’ll run you – wait for it – Rs. 8 crores! First, a quick run down of our four contenders. The Mercedes-AMG GT S is, honestly, one of the finest machines I’ve driven all year – or ever for that matter. 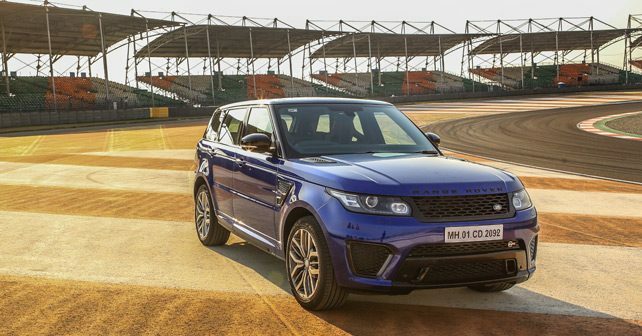 The Range Rover Sport SVR is the first production car to roll out of JLR’s special vehicles division – and the exhaust note tells you immediately that it’s not apologetic about it one bit. The BMW X6 M promises to be a sports car on stilts, which is an M-badge assurance really – the ‘sports car’ bit that is. And the Audi S5 aims to fit sports car looks and performance in a practical, comfortable, luxurious and usable package. And each of these machines has been launched in just the past few weeks. Let’s start with the yellowest machine of the lot. Well, the Merc and Audi could slug it out for that title – but, really, the Audi is a shade brighter. The first time I drove the S5 Sportback was on an ice lake in Finland. So, I know that the chassis is pretty capable. It’s also the most reasonably priced machine here. At Rs. 63 lakhs, ex-showroom, it’s a bit of a bargain. It also has the most diminutive motor, relatively speaking – a 3.0-litre supercharged V6 that puts out 328bhp and 440Nm. It’ll still eclipse 100km/h in just over 5 seconds though, so it’s not exactly sluggish. In fact, mated to a lightning fast 7-speed dual-clutch transmission, the S5 feels positively fast. The exhaust has a nice little bark, and the driveline is as creamy as they come. The S5 is certainly the most usable car here. The ride is comfortable, the cabin is positively plush, and the fastback glasshouse is beautiful. On the road, the S5 has more grunt and grip than you’ll ever need. But on the track it has the lowest top-speed of this bunch, and the tendency to resort to understeer is pervasive. That said, because its all-wheel drive, and has an inherently capable chassis it’s one of the easiest cars in the world to drive fast. It just settles into a natural pace that would embarrass a less capable machine. Let’s just say that there were no sweaty palms when hurling this around India’s racing arena. 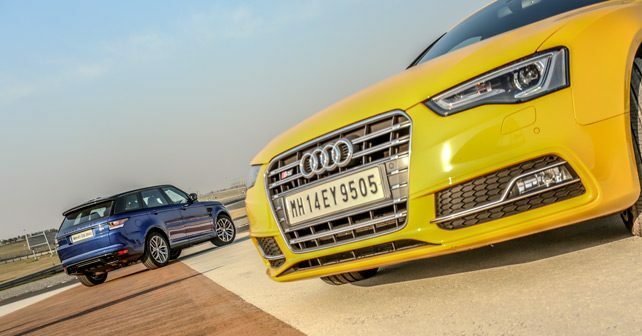 It’s no surprise, then, that the S5 was faster around the track than the far more powerful Range Rover Sport SVR. Of course, a circuit isn’t exactly the natural environment for a machine that can otherwise drive up the cliff face of Everest – but, then, this isn’t exactly an ordinary machine. You would think that JLR would have adjusted the raw soundtrack of the 543 horsepower, 5.0-litre supercharged V8 that they yanked out of the F-Type R before plonking it into the engine bay of the RR Sport – but they didn’t! As a result of which it sounds positively mental. The pop, crackle, and sheer shoutiness is identical to the F-Type – and, in many ways, so is the hysterical surge of power whenever you put your foot down. Of course, it’s a little more hysterical in a two-tonne SUV than in a focused sports car. The Rangie simply squats and shoots off into the distance. It also stops surprisingly well actually. The realization of its girth only occurs when you try to hustle it through a tight bend and then attempt to get on the power early. That’s when the power supersedes the torque vectoring technology and the traction control has to play referee. Naturally, I sent traction control to the bench. But, after a few corners, the torque vectoring excused itself from play as well. A read-out in the (quite impressive) digital instrument cluster informed me that torque vectoring was temporarily unavailable. 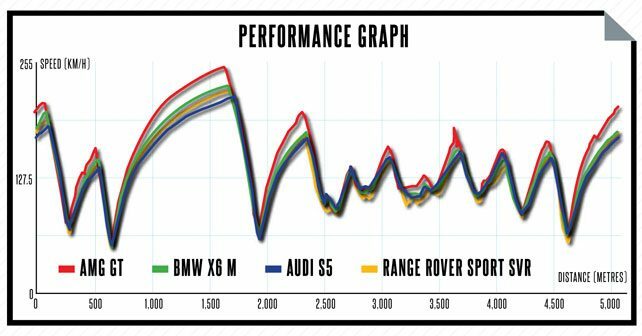 But while the Range Rover is happy to merely bend the laws of physics, the BMW X6 M isn’t content until Einstein is turning in his grave. If you thought that the Range Rover had enough rubber meeting the road, the BMW scoffs at it with its 285/40 R20’s up front and road-roller rivalling 325/35 R20’s at the rear. That unapologetically squat rear-end simply means business – which is pretty much in keeping with the rest of the car. The numbers may sound excessive – 567 horsepower and 750Nm of torque – but the way in which the X6 uses its power is nothing short of miraculous. In fact, on the road it almost feels too powerful (if there is such a thing). Honestly, you begin to wonder when you’ll ever be able to use all of its power – and then you come to the track! At the BIC, the X6 enters a realm that you can’t explain. You see, there’s no denying that it’s big and heavy. Plus, you sit pretty high up. But then you attack a corner, and it seemingly transforms into a M4. It really is that good – and I’m not exaggerating to make a point (something I could be accused of from time-to-time). The way the X6 M turns in, stays completely flat, sticks to the tarmac, and powers out truly beggars belief. It just stays planted at all times. The rear-end even comes around just the right amount to ensure that you can put the power down early. It’s absolutely sublime. And this is reflected in the lap time. Sure, we had pretty good track conditions – because the temperature was relatively low – but a lap time of 2:22.8 is simply astounding. But lap times don’t come any more astounding than a 2:15.4 – that beats our previous fastest car by a full three seconds. Correction – annihilates! Sure, the R8 V10 may have had worn brakes & tyres, and the ambient temperature in the shade may have been in the 40’s – but, any way you slice it, a lap time in the 15’s is very special indeed. And this is a car that had been on track duty for the past few of days on another event – so it’s brakes too were well past their prime. To say that the AMG GT is the sweetest car that I laid my hands on in 2015 would be wholly accurate. I first drove it at Laguna Seca – one of my favourite tracks in the whole world – in December 2014, and merely to point out that I was impressed would be a huge understatement. The SLS AMG, predecessor to the AMG GT of sorts, was undoubtedly impressive as well – but it wasn’t what you would call balanced. It had a sinister side to it, which was always waiting in the wings to rap you on the knuckles if you took liberties with it. In comparison, the AMG GT is a lovable little puppy. The steering is light – perhaps overly light – but incredibly direct and responsive. Sure, it may not have the best feel through the wheel – but that doesn’t really matter when the chassis is as progressive and communicative as this. It’s like this car comes with a dash of Lewis Hamilton’s driving skills. It just makes you look good. Before you know it, you’re doing 255km/h on the back straight, and apexing turn four at three-digit speeds. The limit is incredibly high, but also quite accessible – and that’s the beauty of this machine. With such a massive bonnet outstretched in front of you, it should be intimidating. With power and noise like this, it should make your knees shake. But it just doesn’t. It simply settles into a progressive four-wheel drift that makes you feel like Ari Vatanen. It may not be as visceral as a Porsche 911, but it feels more planted if that’s possible. Where the front end of the 911 may get a little light mid-corner, or a mid-engined supercar may be willing to swap ends if your inputs are too abrupt, the GT S is just neutral and forgiving. But it’s no less sharp or focussed. The beauty of this machine is that it’s fast – very, very fast – without scaring you to death. Now that may take the appeal away for some, but you simply have to appreciate what the AMG engineers have done with this machine. If some of their older machines were out to kill you, this one will hold your hand all the way – and encourage you to go faster-and-faster all the time. What a machine! Sure, for everyday use, I would pick the S5. It simply offers the best combination of comfort and speed. Even though the brand new A4 is around the corner (the car on which this is based), I would still shell out the asking price for this four-ringed speed machine. It actually offers pretty good value if you think about it. For the track, there really isn’t any contest – the AMG GT S, as a pure sports car that offers supercar levels of performance and presence, is impossible to beat. As a machine to haul your family and pet dog at light speed, the Range Rover Sport SVR is hard to top, but if it’s performance that your Beagle is after then the X6 M takes it to another level. 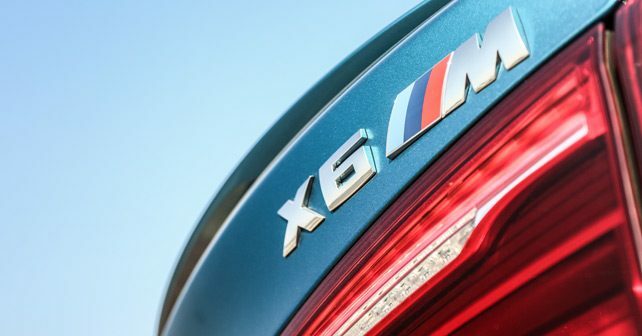 The BMW M engineers just continue to astound you with their ability to make machines with the M-badge perform in a way that defies the laws of physics. But I would choose the X5 M over the X6 every day of the week – I think it looks WAY better and is more practical to boot.